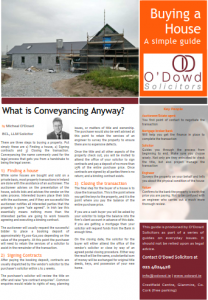 We are delighted to offer the 2017 edition of our conveyancing guide for download. This guide sets out the steps and pitfalls associated with buying a property and sets out a roadmap for the buyer. The guide can be downloaded free here. If you need any further information on buying, selling or remortgaging, please don’t forget to request a quote through our helpful web form.